I don't even remember posing for this picture, but apparently that was me back in 1993, shortly after we launched "Betrayal at Krondor". 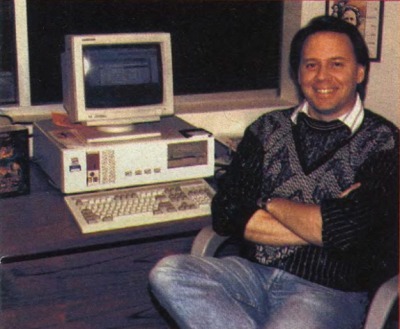 Hi, my name is John Cutter and I have been a professional Game Designer for over 32 years. Over the course of my career I have been fortunate enough to Design and/or Produce over 60 games, including award winners like "Fairway Solitaire", "Betrayal at Krondor", and "Defender of the Crown". My last big game was "Fairway Solitaire". I came up with the concept and design, plus I wrote and directed all the voice work, created and/or edited many of the sound effects, designed all the courses, and I even wrote some tools to manage the courses and the Daily Challenges. Have you ever heard of Fairway Solitaire? It’s one of those “casual” games you might find while you’re slumming at Big Fish. Except this isn’t one of those games where you have to click and click and click until you find the hidden broom. Oh no. What this is is an incredibly awesome puzzle game, masquerading as solitaire. Also, there’s some kind of golf thing going on? I installed it an hour ago just to see, and I just now dragged the demo to the trash. I can’t have something like that on my work machine. Fairway was nominated for "Mobile Game of the Year" and "Casual Game of the Year" at the 16th Annual Dice awards. 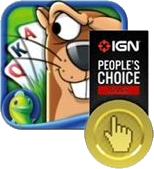 The IGN editorial staff selected Fairway as one of the Top Five Mobile Board Games, and it later won the People’s Choice Award for 2012! "Betrayal at Krondor" is a DOS-based role-playing game that I Designed and Produced for Dynamix in the summer of 1993. Despite a slow start it went on to win "RPG of the Year" nods from 5 different magazines and "Game of the Year" from two others ("Compute" and "Byte"). The "Defender of the Crown" title screen convinced me to take the job at Cinemaware. I was pretty skeptical about the company but President Bob Jacob gave my wife and I a tour and then took us into a room to show us the company's first game. The instant the title screen appeared my wife leaned over and whispered, "Take the job!!" Like many Cinemaware games, "Rocket Ranger" drew inspiration from Hollywood, in this case the old serials like "King of the Rocket Men" and "Commando Cody". As with many other early titles we created at Cinemaware, "Rocket Ranger" included a dashing, courageous hero, and a beautiful, voluptuous damsel in need of rescue. Digital misogyny at its finest!